Dialogues was an indie/screamo band from Harrisonburg Virginia. They started off as a spazzy band; keyboard, bass, drums, dual vocals by drunks trying to be sassy. They never even practiced before their first show really. They recorded nothing. That didn't last long because the alcohol took effect. They then reformed soberly and changed things up a bit; lost the keyboards, the drunkest singer ever, and added two guitars. Then they became a truly amazing band. The line up changed here and there as they ruled. 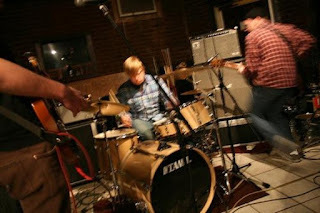 They released some self released cds, and a split 7" on Rome Plow Records with Kids Explode. They broke up in the spring of 2006. Members of Dialogues play in other projects, such as Order (of the dying orchid), Bantam Draper, American Tourist, North, Hi Ho Six Shooter and Savage Land. Ex-members of Sing! Sing! Prison, and Octegenarian. Pretty decent description from Last.fm, don't really have too much to add there.. I have here their demo, and the split with Kids Explode, not sure about those self released cds. The vocalist has a pretty interesting shouting style of singing, kind of reminds me of some more modern day stuff. It's all actually pretty good, recommend. I might post Order (of the dying orchid) at some point as well, as I have stuff by them.